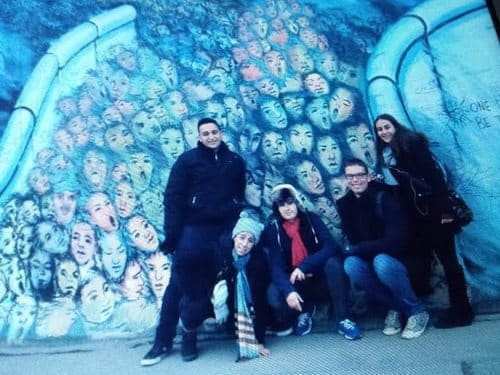 Berlin is cold! I don’t care what anyone else says, coming from Israel weather to 37 degrees is cold!! Nonetheless out trip so far has been smooth sailing…minus the part where Rachel was detained in our transit stop in Istanbul..because she had a metal fork in her carry-on from Israel…… Ever get yelled at in Turkish!?!? We arrived and made our way easily to our hotel, located in a central part of the city ( the city is HUGE), and is modern, clean and new. 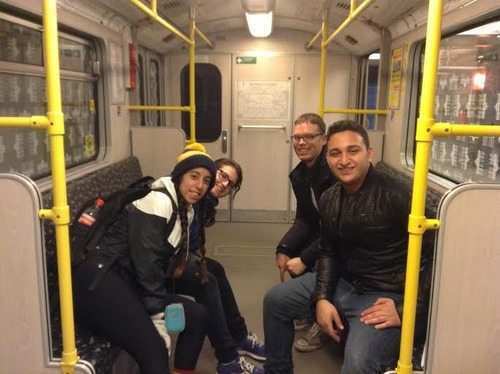 The only way to get around the city is to travel by public transportation. The system seems daunting at first but we got the hang of it really fast. It’s actually quite convenient. After checking in, we grabbed a quick lunch as we headed to the Story of Berlin Museum. It was an interactive and informative tour. We had a private tour guide who led us through the history of Berlin from the 1600s up to now. The museum is constructed really nice and modem. 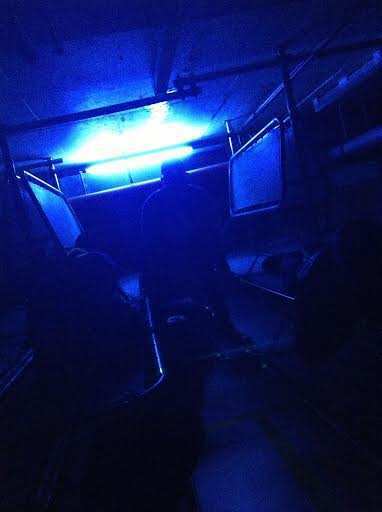 The tour also included the famous nuclear bunker created in 1972 at the heat of the Cold War. 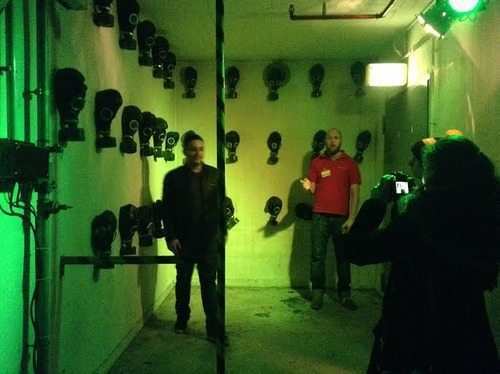 It is still intact but very creepy to walk around in. Take a look at the pictures attached. After the museum we took two different subways and walked to dinner. We went to an authentic German restaurant and mostly ate potatoes and cabbage as that is probably the most common German food. After dinner we walked back to our hotel. The students are pretty tired so I don’t think they will be going out to explore the city nightlife just yet. After a great breakfast at the hotel, we went to visit the Reichstag building, or the German Parliament. Luckily, this time no one brought silver utensils and we went through security just fine. The reichstag is carefully constructed from new and old parts of the original building from WWII. 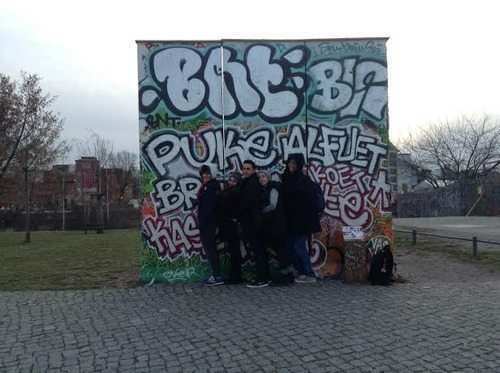 The government wanted to keep some of the original walls and structure as a reminder to what the German republic stood for before Hitler and the Nazis took over in 1933. As we made our way through the building, there was quite a lot of commemorative drawings and artwork for the murdered people both Jewish and non-Jewish including a large painting installation and a book with description of some of the victims. The building is most famous for its glass dome, located atop the plenum hall in order to let daylight in. After the Parliament tour we met our guide for the Jewish walking tour. We began the walking tour at the newest memorial- the Gypsy memorial created in 2012 to commemorate all the gypsies killed during WWII. From there we walked over to the homosexual memorial, which commemorates all the homosexuals persecuted under Nazi rule. Across the street is the memorial for the murdered Jews during WWII. The memorial is quite impressive as it leaves a lot up for interpretation. Why are the “gravestones” different heights? It might be because each represent a different age at the time of their death, it might be that they represent different sizes of Jewish communities around the world at the time, or it might represent the dwindling population of the Jewish communities because of the war. What do you think? After the memorials we headed to the Jewish quarter area. Since there was never an actual Jewish Ghetto in Berlin, there is no defined Jewish quarter, rather an area with some scattered Jewish buildings. We first visited the statue to commemorate the kindertransport. Then we walked over to the place where the first Jewish synagogue in Berlin once stood. Called the “Old” synagogue, it was torn down when the then Soviet ruled east Germany side wanted to build housing. Coincidentally, the now garden area is across the street from the famous factory revolt on Rose street (rosenstrasse) took place in 1941. The garden is also home to a moving sculpture depicting the revolt. We then walked over through captivating courtyards filled with graffiti and pubs. We made our way to a hidden museum called the Otto Weidts workshop for the blind. This wad actually a workshop for the blind owned by Weidt during the war. He helped hide Jews by having them work at the workshop thereby saving some of them. His then secretary is the only remaining survivor and she still tours the world telling of her experience. After the workshop we walked to the old Jewish cemetery where a makeshift Moses Mendelson grave lays. We lit a memorial candle and said a prayer. 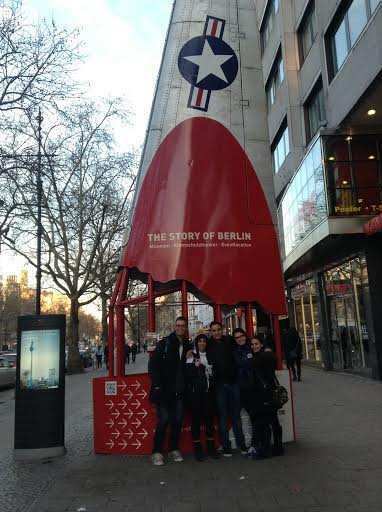 Following the walking tour we grabbed a some lunch ans then walked through Alexanderplatz square, where the famous TV tower stands, as we made our way to the east side galley where the last remaining part of the Berlin wall is used for artwork. The graffiti is unique and entertaining as every few meters is a new piece of art. After walking for most of the day we stopped for some tea before we headed to the famous Madame Claudes bar for the common people, otherwise known as the upside down bar where literally everything hangs upside down from the ceiling. Some students returned with me to the hotel while others stayed out a bit longer to explore the Berlin nightlife. After have a great breakfast again, by the way our hotel is so trendy and happening, so many young teens are staying here. It is also around the corner from the famous “new” synagogue. In any case, we spent our morning at the Wannsee House. 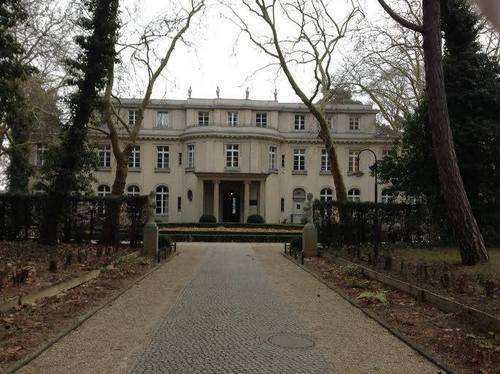 The Wannsee House is where the final solution was drafted in January 1942 by the heads of he Nazi party and the SS. The exhibit consists of images and minutes from the meeting as well as the events that led to the conference and an in depth explanation of WWII. It is quite difficult to go through the exhibit and not feel uneasy, sad, and angry. After we all finished walking through the house, I asked the students to each talk about how they felt walking through the museum. I most shared that they were disturbed that something like this happened and that being in he house made it seem so much more real. Others explained that it strengthened their Jewish identity as well as reinforced their appreciation for Israel and Zionism. After the Wannsee House we headed to the Israeli Embassy. We went through strict security, with no metal forks, as we were escorted into the main boardroom where we sat down with the Director of Public Affairs. He explained to us the three main pillers that describe Israel-Germany relations, the first is the obvious past, second is economic and political interests and the third is values. 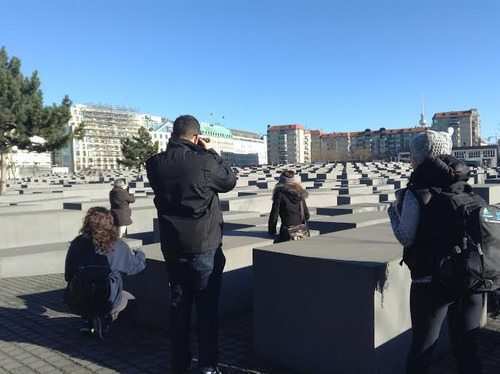 There are over 100,000 Jews in Germany and their relationship with the Germans is pretty smooth as the Germans still hold an uneasy feeling over what happened not too long ago. 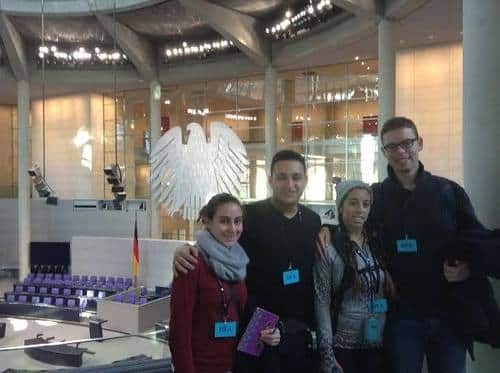 As Chancellor Merkel proclaimed in 2008, the safeguard of Israel is one of Germany’s top priority and they work hard to ensure that Israel is aware. 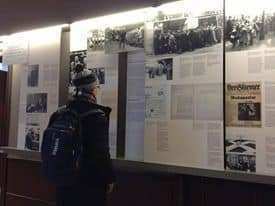 Additionally, the Director explained to us that while there is support and the Germans tend not to want to criticize Israel, antisemitism is still very much present, especially in now the third generation where they feel detached from what their grand or great grandparents once did and in turn justify their anti Israel sentiments. After the embassy we returned to our hotel area where the students had about two hours for free time before we met back up for the dinner show. 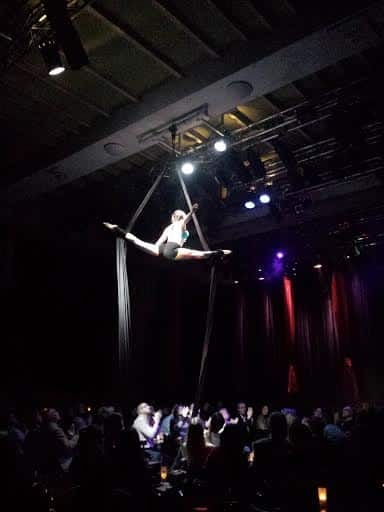 The show called Beyond was a mixture of acrobatics and interpretive dance, some parts were funny and in others we were mesmerized by the dancers’ talents. The food was also delicious. Tomorrow we are leaving the city in the morning and heading to the Sachsenhausen concentration camp. Today we started with a heavy heart at the Sachsenhausen Concentration camp located north of Berlin in a town called Oranienburg. The camp was created in the 1920s but became an official imprisonment campy in the 1930s. By 1938 it was a fully functioning concentration camp. 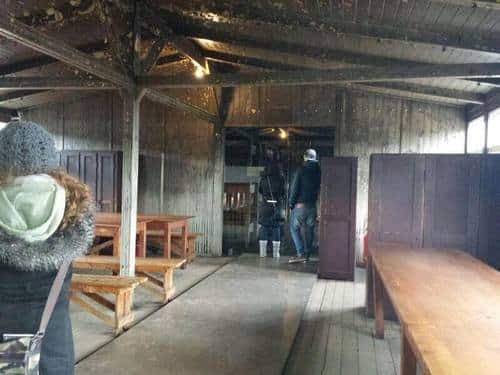 What is unique about this camp is that in it sat the SS headquarters that controlled Auschwitz and other camps. It also sits in the middle of the German police academy and the SS youth training center. The camp was originally build to hold only 10,000 people but but 1944 it was holding 60,000 people. In the camp were political prisoners, gypsies, and of course Jews. Jews were ordered to be treated the worse. This was to be a work camp where you basically worked til you died. The mass killing came a bit later in this camp and while normally they used guns and gas chambers, here the nazis used the cold weather as their biggest weapon, often leaving the prisoners to stand outside for days in the freezing cold with no shoes and clothes, eventually the majority froze to death. Later the nazis installed gas chambers and dug out extermination bunkers where they lined prisoners up and shot them. After the liberation, the Soviets took over the camp and imprisoned nazis and Germans in it. They erected a huge monument in the center of it signifying the triumph of communism and used the camp as an example to those who dont believe in the good of communism. 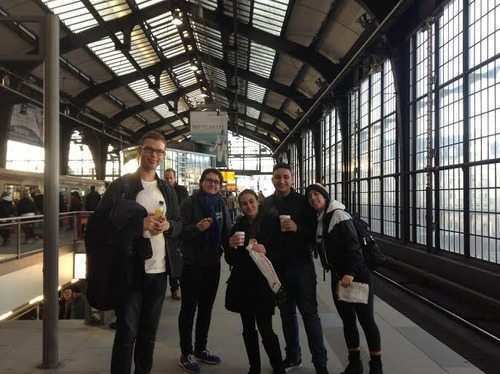 After braving the cold for those few hours we took the train back into the center of Berlin heading to the Jewish Museum. The museum is unbelievable. 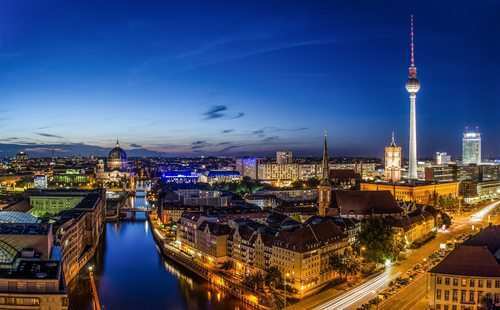 I highly recommend it to any of you who plan to visit Berlin. The magnificent architecture, which has significant meaning in itself, creates and interactive and dynamic tour as you go through the last 1000 years of Jewish history. The museum exhibition offers the visitors a chance to engage with the Jewish history while ensuring relevance to modern day. I could have stayed there for days. 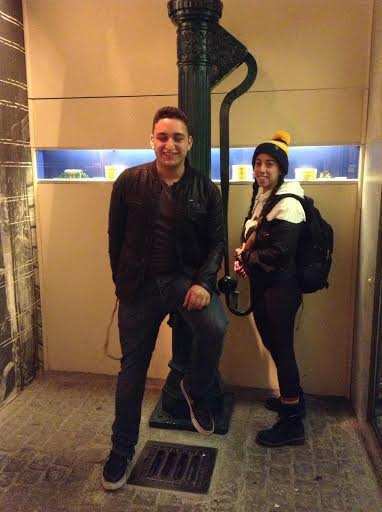 The students agreed that this museum was different from anything they have ever visited in the past. With a quick stop at the hotel to change clothes, we headed to dinner at Berlin’s famous white trash fast food restaurant. It is anything but fast food, rather a fun and happening restaurant resembling a tavern and includes a funny menu and live music. We has a great time as we reflected on the last few days.